Allaah Ta’aala says in the Qur’an-e-Kareem, “Every Soul will get the Taste of Death…” and “When Death arrives it neither delays nor comes early for a moment…”. Indeed, Death of a Learned is the Death of Universe. 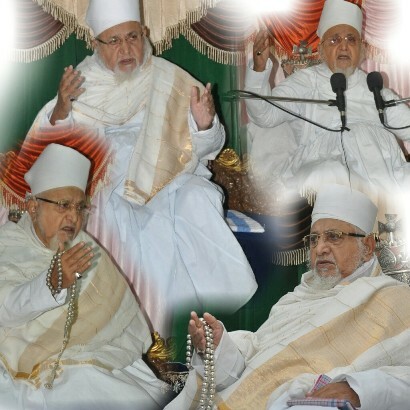 Saiyedna wa Maulaana Abu Haatim Taiyeb Ziyauddin Saheb (aq) – the 44th Da’i ul Mutlaq and Siraaj um-Muneer of Alavi Bohra Jamaa’at commenced his Spiritual and Eternal Journey on 5th Sha’baan ul Kareem 1436 AH/ 23rd May 2015, Saturday from Daar-e-Fanaa to Daar-e-Baqaa. Wave of Huzn and Bukaa spread throughout the Jamaa’at. Mumineen started gathering at Devdi Mubaarak Taiyebi Mahall from the morning itself to give the payghaam of Ta’ziyat to Ahl ul-Da’wat. The rituals and rusoomaat of Ghusl-o-Kafan were completed before the Zohr Namaaz. Janaazah Mubaarakah and Nasoot Mubaarak of Muqaddas Maulaa was kept at the Devdi Mubaarak for the Aakhri Deedar, Maghferat and Qadam-bosi of Mumineen and Mumenaat. The namaaz of Janaazah was led by Ma’zoon ud-Da’wat il-‘Alaviyah Saiyedi Haatim Zakiyuddin Saheb (dm) at Masjid-e-Nooraani at 4 pm. Namaaz of Janaazah was preceeded by Bayaan of Ma’zoon Saheb (dm) which was embellished with the Sift-o-Sanaa of Muqaddas Maulaa. Nasoot Mubaarak of Muqaddas Maulaa was buried beside the Qabr-e-Anwar of 43rd Da’i ul Mutlaq Saiyedna Yusuf Nuruddin saheb (aq) in Rauzah Nooraaniyah behind the Ghurrat ul-Masaajid at Badri Mohalla. To bid a faithful and spiritual farewell to their beloved Maulaa, Mushfiq father 44th Da’i ul-Mutlaq al-Muqaddas al-Murtaqi ilaa Daar il-Amne wal Qaraar Saiyedna Abu Haatim Taiyeb Ziyauddin saheb (aq), a sea of devotion and ikhlaas in form of mumineen-muminaat-children got converged in the evening of 5th Sha’baan 1436-23rd May 2015 at the maqaam of 12 Du’aat-e-Kiraam (ra) of Vadodara, Devdi Mubaarak, Badri Mohalla. 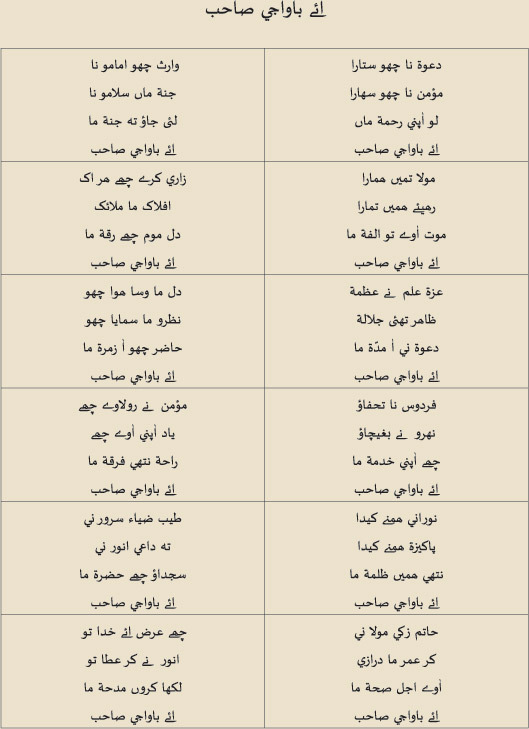 The Shaanaat of Taiyebi Da’i got evident when the mansoos of Muqaddas Maulaa, Saiyedna Haatim Zakiyuddin saheb (tus) did Didaar-e-Aakheri of the Chehra-e-Pur Ziyaa of Muqaddas Maulaa. Mumineen gathered near Devdi Mubaarak for du’aa of their maghferat, mu’aafi-talaafi and to get Taiyebi Barakaat by shouldering the Janaazah Mubaarakah to Nooraani Masjid. Each and every mumin took this opportunity as a farz and lifelong sawaab to give ta’ziyat to Ahl ul-Da’wat. In the Mazaar-e-Yusufi behind Nooraani Masjid on the right side of the Qabr-e-Mubaarak of 43rd Da’i ul-Mutlaq Saiyedna Yusuf Nuruddin saheb (aq), Saiyedna saheb (tus) performed rusoomaat of Tadfeen (burial) of Muqaddas Maulaa. On the third day of the Intiqaal, Majlis-e-Ziyaarat and Khatm ul-Qur’an was held in Nooraani Masjid where Saiyedna saheb (tus) recited the Du’aa of Sadaqallaah and delivered bayaan revealing the esoteric meaning of the wordings in the Du’aa depicting the meaning of Da’wat and the Khidmaat of Da’i.